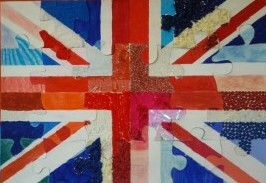 Shirlie writes: "My class recently completed this Union Jack Flag for the Queen's Jubilee. It actually turned out really well and was an easy activity to complete. 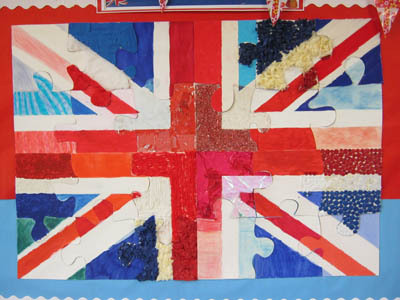 I drew the flag onto large pieces of card and then drew a jigsaw over the top, marking all the colours in each piece. (I used the interactive whiteboard for this). We cut up the pieces and each child 'coloured' their piece in a different way i.e. crayons, chalks, cellophane, tissue paper, paint & sand, fabric and whatever else they could think of! Then we joined them back together again and voila "